Looking back on it now, Quinnipiac’s women’s soccer head coach Dave Clarke can’t help but crack a smile. It was 1988 and for the first time ever, Ireland, Clarke’s native land, had qualified for the European soccer championships. For a soccer fanatic like Clarke, this was like the Super Bowl and World Series combined. The only downfall was that Clarke was in America where soccer lacked popularity. Ireland was matched up with England in the first round and immediately, Clarke and his cousin tried to get their hands on airline tickets into West Germany, where the tournament was being held. Since missing the game was not an option, Clarke knew that they would have to get creative. On June 12, 1988, Clarke and his cousin scoured the streets of his neighborhood with an eye out for houses with satellite dishes. They knocked on doors and pleaded with strangers for a chance to commandeer their television set for the game. But negotiations broke down and the reality of being able to watch the game was looking grim. Finally, Clarke and his cousin took solace at a small bar in Bronx, N.Y., named Hennessy Headquarters. The trip took a car and train ride to get there but the journey was well worth it as an unlikely Irish team defeated the heavily-favored English team. About a year earlier, Clarke arrived at John F. Kennedy International Airport on Aug. 24, 1987. His final destination was Central Connecticut State University, where he was attending on a full soccer scholarship. At this time in the United States, soccer was an afterthought. 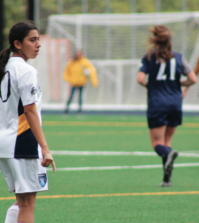 Even for some of Clarke’s teammates, soccer may have been just a means to an end. But for Clarke, soccer was an integral part of his past, present and future. In 1998, Clarke decided to hang up his cleats after six years on the Connecticut Wolves A-League team, which was in a league that was essentially a feeder league to the MLS. He wanted to conquer another aspect of the soccer universe. He wanted to be the man in the director’s chair. “My goal has always been whatever I didn’t accomplish as a player, I wanted to accomplish as a coach,” Clarke said. Stephen Coxon, who’s currently an assistant coach for the Bobcats, has known Clarke since they played together at Central Connecticut and then again on the Connecticut Wolves. Coxon was also on Clarke’s coaching staff at the University of New Haven. Both Coxon and Clarke agree that Clarke’s coaching style serves more of an “educator” purpose then a coach. A key element of Clarke’s coaching persona is his ability to mask his emotions. While some players readily embrace his reserved style, it can be a tough adjustment on others. Quinnipiac’s senior goalie Jillian Kelley admitted being very intimidated during her freshman year. Even though she thought she and Clarke had a positive relationship, she didn’t talk with him as much as she would have liked. It wasn’t until her sophomore year that she and Clarke really bonded. After suffering a season-ending knee injury in the preseason, Kelley spent her time on the bench connecting with her coach. Clarke’s philosophy has been honed through coaching experiences that most can only dream about. In 2008, he joined the coaching staff of the Ireland women’s national team. Clarke had a prior relationship with head coach Noel King from back when Clarke was a player in Dublin. As a member of the staff, he put together videos and scouting reports as the Ireland team played three matches against the United States. Clarke’s schedule left little time for him to adjust when he finally returned to Hamden. 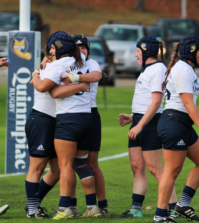 “One evening you’re standing, looking at a team that’s got Hope Solo, Christine Rampone, and Heather O’Reilly, and then the next minute, I’m back coaching Quinnipiac,” Clarke said. The success of the United States’s men’s and women’s national teams has been vital in the growth of soccer in America. Since 1990, soccer has been easing its way into the limelight. An New York Times article from 2010 reported the steady incline of soccer’s participation rates. According to the United States Soccer Confederation, the number of youth soccer players in the United States in 2010 hit 4.04 million, which is double what it was in 1990. 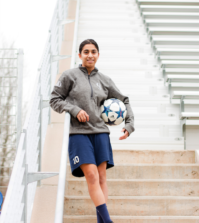 The number of high school soccer players also doubled, reaching 730,106 athletes, according to the Sporting Goods Manufacturers Association. The article also noted that the NCAA reported a 115 percent increase in the number of women’s college teams in the United States since 1994. The number of men’s teams also increased by 27.6 percent. Clarke has written about the rise in popularity more and more after receiving his master’s degree in journalism from Quinnipiac in 2010. He attributes the consistent growth to a number of factors, but he believes that technology trumps the rest. On television and on the internet, soccer games have been made more and more readily available for viewing. All ESPN channels, with the exception of maybe the “The Ocho,” are involved with soccer. An article on SoccerHype.com reported that ESPN bought the rights to show 46 English Premier League games in 2009. Also, ESPN2 broadcasted the UEFA Champion’s League final in 2008 to 1.09 million viewers. One of the sites that Clarke contributes to is called SoccerBanter.org, which launched on March 1, 2011. 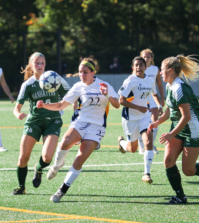 Brendan Faherty, the site’s editor and assistant women’s soccer coach at the University of Massachusetts, is an old friend of Clarke’s. Faherty strongly agrees with Clarke’s analysis of technology’s positive impact on the soccer world. But Faherty doesn’t want the success of the United States’s national teams to go overlooked, and the reason is fundamental. There is no mistaking a sense of pride in Clarke’s voice when he talks about where the United States is today versus where it was when he first arrived in the country. He also knows it’s only going to get better.